Fresh Store Builder - Legit or Scam? Fresh Store Builder Reviews – Legit or Scam? The Fresh Store Builder (FreshStoreBuilder.com) is a website selling the ability to create your own online store filled with products from Amazon.com. 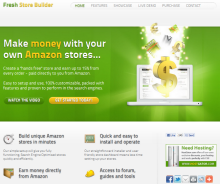 The stores can be online within minutes, and making money within days according to Fresh Store Builder. There is no need to purchase or store inventory, process payments, or ship products because you won’t actually be a store, you’ll be an Amazon affiliate. According to Fresh Store Builder, their websites are customizable, built in minutes, fully search engine optimized, and cost a one time fee of $147, currently down $50 from $197. If for any reason you are unhappy with your online store, there is a 30 day money back guaranteed refund at FreshStoreBuilder.com. Do you have experience with Fresh Store Builder? If so, please leave a review below. Average Rating for " Fresh Store Builder " is 3.88 out of 5 based on 97 reviews. After doing much research about websites, store builders, Etc., I went with Fresh Store Builder. Being someone who had never built a website, never had an online store, I was scared! After getting inside I couldn't be more relieved! From their options, choices, and all the tips and tricks I am SO happy I went with them! Anytime your stuck or don't have a clue they not only have amazing support but all the articles/videos are such a huge help. I was nervous to go live, but they made it so easy! If your hesitant and don't have a clue like I did believe me you will not be disappointed and you won't get this value anywhere. I built my first FreshStore about a month ago and have had a positive experience so far. The installation video was clear and straight forward and using the FreshStore Builder is very intuitive. I think the program itself is well written and SEO friendly considering my store was indexed in Google within a few days after launch and I have had no bugs or problems. I had one issue with my server settings which was resolved the next day through an online help ticket. Gaining traffic is always the challenge for any new website but I did have one sale within the first week which was a pleasant surprise to see in my Amazon account. I believe the developers are interested in staying current with SEO trends and further refining useful new features of the Store. I'm a newbie with this website marketing with a few technical challenges but I have found "Fresh Store Builder:" to be easy to work with and better yet I have had informative answers sent back to me from a very courteous and caring staff. I'm sure with my continued effort to perfect my site and their continued expertise that it will be a success! I'll try to find them all (because most weren't my ideas) to give credit where credit is due! I was really surprised with FSB dashboard. It was way more professional and useful than what I was expecting. I like the software very much. I've had very good experience with the support as well, they addressed my issues very quickly. Guides are great... Videos tutorials are the best for everyone, with or without experience on the field. Also good support and ideas from forum and Facebook group. I am pretty happy with FSB so far and it's just much more than what I expected really. Definitely recommend to anyone who wants to get on Amazon affiliate business. Hi so u actually used this and didn't get denied to amazon associates?? Im really doing my research and want to make sure this is going to help me with amazon. This company is the worst. They pretend to have costumer service. No phone number. No easy way to cancel them. They keep trying to upsell everything. I have changed the nameservers several times and they don't allow it even though I've canceled. SO basically they are holding my domain hostage. I use a number of e commerce build products across 5 networks. It is beautifully designed and has easily navigable shop templates. My review as a customer. I have bought Fresh Store Builder earlier this year (2016) and i can tell that is the best investment I've made in my online career. I wish i could find it years before!! Very easy and simple to use, anything can be found with step by step guides, you have the ability to create content sites, blog sites, review sites, you can promote anything you like as an amazon affiliate with videos-pictures-coupon codes etc. Is a Top quality product !! The support is excellent and the most important is the owner (Carey) to be by your side, adding new features, helping out anyone, advising with tips and tricks in our Fcb group and in the FSB Forum.. What else do you want ??!! Since starting with fresh store builder one month ago I have found it very easy to use and the only product I have tried from several that actually works for building affiliate stores. From day one I started to get hits to my amazon affiliates account which was great and I have now started making sales. This product rocks and I don't recommend any other for store building. I have now built more than 30 sites which I know will be successful. Check out http://www.muscleenergy.co.uk this is my flag ship store and I have my own amazon products listed so I get paid twice :) how cool is that, once for the sale then again as an affiliate. Approx., what income can be expected from one store every month? I have built a store and its already 2 and half months but no sales till now. can you give me some tips in getting sales. Carey and his team are a breath of fresh air in an industry riddled with dodgey fly by nighters. They really do care about their clients and do all they can to help them get up and running with regular interraction via fbook etc.. I'm also learning that in setting up an FSB store I'm not just learning how to become an Amazon affiliate; the process is also a great grounding in the techniques of internet marketing area per se.